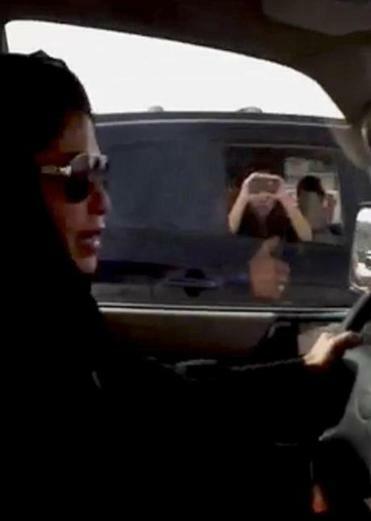 Associated Press/Saudi Women for Driving via Change.org/Eman Al-Nafjan The passenger of a passing vehicle looks across as a woman drives her car in defiance of Saudi Arabia’s ban on women driving, in Riyadh, Saudi Arabia, 2011, in this video frame grab from the Saudi Women for Driving coalition. What hope is left for the Arab Spring? Egypt is returning to military dictatorship. Syria is a bloodbath, spiraling into a deeper and more violent civil war. Yet some remnant of idealism remains — on the roads and highways of Saudia Arabia. In 2011, inspired by the revolutions in neighboring Gulf States, Saudi women started their own movement. Silenced and hidden in a virtual gender apartheid, they revolted by cunningly tackling a seemingly mundane issue — the right to drive a car. While some protests in the region faltered as they descended into factionalism and civil war, the women’s movement in Saudi Arabia continues to throttle ahead. Like similar protests in 2011 and 2012, this Saturday is being promoted as a day of defiance behind the wheel. More than 16,000 people have signed a petition demanding the government provide means for women to obtain driver’s licenses. There is no official law that prohibits women from driving, but women cannot obtain driving licenses from local authorities. In some ways, this paradox reflects the depth of the women’s challenge, the deep roots of the cultural norms they are challenging. But in doing so, they may liberate some men, as well. In Saudi Arabia, neither men nor women have political rights. Learning from the 1979 Iranian revolution, in which the religious establishment managed to mobilize a people’s revolt against the shah, the Saudi royal family has made sure to appease the country’s clerics by implementing strict Islamic codes. Unfortunately, in the patriarchal society, stricter religious codes have been interpreted as justification to undermine women’s rights. Under a system of male guardianship, women are forced to be dependent on men. To travel, study, marry, or even receive medical treatment, they must obtain permission from their fathers, husbands, or sons. Women received the right to work without a guardian’s permission only as recently as 2011. It was once enough to tell women that to be virtuous is to be obedient. But in recent years, as women’s level of education has risen, it has become harder for the religious establishment to keep women down. There are more women with higher-education degrees than men, according to 2011 data from Saudi Ministry of Higher Education ministry, but the women make up less than 15 percent of the workforce. Lacking the right to drive, those women who do have jobs must rely on male relatives to take them to work or spend between 30 to 60 percent of their salaries to hire drivers. Focusing on driving as a symbol for a fight against larger injustices has been a smart move by the activists. First, they have the advantage that no explicit law bans women from driving, thereby giving them more space to make their protest. They aim to hit the male guardianship system, but to choose their battles strategically. (Had they protested against the guardianship directly they would have faced a steep wall of resistance.) Second, the issue strikes an immediate chord with American women, giving them an instant source of sisterhood and support. The movement has seen other signs of progress. No longer do clerics cite religious law to justify the driving ban, Sharif has observed. Instead, they rely on much-ridiculed scientific claims that driving can be damaging to a woman’s reproductive organs. Meanwhile, women are now allowed to ride bicycles, albeit for recreational purposes only. Two female athletes competed in the 2012 London Olympics. King Abdullah has appointed 30 women to the Majlis al-Shura, a council whose 150 members advise him on matters of public policy. Some women councilors have since supported activists’ demand to lift the ban on driving. And in 2015, women will be able to vote and run in municipal elections. There has been no revolution in Saudi Arabia. But the persistence and cunning of the Saudi women’s movement has breathed life into the concept of the “Arab Spring” as a source of peaceful awakening. And the key to its success has been behind the wheel. Prodita Sabarini, an Indonesian journalist, is the 2013-14 International Women’s Media Foundation Elizabeth Neuffer fellow.